Buddy Punch is a simple yet very powerful time clocking software that works for both employees and administrator. The system is accessible online via web browsers. 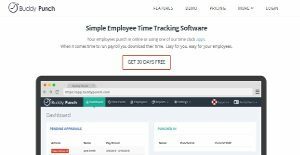 It offers a vast set of functionalities and tools for both administrators and employees, including time tracking, time off requests, and payroll to name a few. In contrast of traditional time clock programs that are usually installed on a dedicated device, Buddy Punch enables workers to clock in and out each day without having to troop down the clocking PC as they can do so from their own workstation. For administrators who prefer more control, Buddy Punch can provide employees with their own QR codes that they can have printed and scanned at a single, designated PC. Buddy Punch is a simple and very straightforward time monitoring and tracking platform ideal for small to medium-sized businesses. Time is money and Buddy Punch ensures that both company and worker are getting the most out of their time. With Buddy Punch, workers can be given permission to clock in and out from their workstations, instead of having to go to a centralized time clocking equipment or PC. Businesses that are more inclined to centralize time clocking can set up a dedicated PC where they can have employees swipe their assigned QR codes. Buddy Punch comes with a rich feature set and functionalities that are not offered by a number of time tracking systems. Aside from time clocking options, the system also enables employees to correct errors in their time card via the employee portal, with corrections pending approval from managers. The employee dashboard features a very simple and easy to navigate interface where employees can submit their time cards. From the administration’s end, Buddy Punch delivers a dashboard that is user-friendly and make time management and tracking a breeze. Buddy Punch automatically syncs its clock with all the PC, ensuring that payroll reports are accurate. Another useful feature is that Buddy Punch can calculate accruals. Pricing is another benefit that many companies can take advantage of. Buddy Punch comes in several product plans depending on company size or number of employees. This allows companies to pick a plan that suits their size of their enterprise without going overboard their budget. As an online access and attendance system, Buddy Punch comes with all the functionalities of traditional time card tools, with the additional integration options and mobile implementations to address the necessities of today’s workforce. What Problems Will Buddy Punch Solve? Access and attendance tools are now largely replacing manual time card systems, which have proven to be impractical, time-consuming, and prone to human errors. A centralized time tracking tool is always a better alternative to any spreadsheet or other old-school system, and it doesn’t take rocket science to implement and operate them for small and large businesses. From logging in and out, to reviewing past entries, Buddy Punch’s simple but powerful approach to monitoring and recording work times rendered by employees. Each organization has different requirements and requires a software that can be personalized for their size, type of employees and buyers, and the specific industry they are in. For these reasons, no platform can proffer perfect functionality out-of-the-box. When you try to find a software system, first be sure what you need it for. Read some Buddy Punch reviews and ask yourself do you need basic tools or do you require advanced functionality? Are there any industry-specific functionalities that you are looking for? Get the answers to these queries to help your search. There are lots of factors that you need to consider and these include your budget, specific business wants, your organization size, integration requirements etc. Take your time, use a few free trials, and finally zero in on the platform that presents all that you need to boost your organization efficiency and productivity. How Much Does Buddy Punch Cost? Buddy Punch Time Clock Software offers pricing plans that easily suit the size of your company. All plans come with a 30-day free trial. We realize that when you make a decision to buy Time Tracking Software it’s important not only to see how experts evaluate it in their reviews, but also to find out if the real people and companies that buy it are actually satisfied with the product. That’s why we’ve created our behavior-based Customer Satisfaction Algorithm™ that gathers customer reviews, comments and Buddy Punch reviews across a wide range of social media sites. The data is then presented in an easy to digest form showing how many people had positive and negative experience with Buddy Punch. With that information at hand you should be equipped to make an informed buying decision that you won’t regret. What are Buddy Punch pricing details? What integrations are available for Buddy Punch? If you need more information about Buddy Punch or you simply have a question let us know what you need and we’ll forward your request directly to the vendor.